The Empire Center, a nonpartisan think tank in New York, released a report today suggesting that New York has lagged behind the rest of the nation in making new millionaires. From 2011-2012, the United States on the whole saw a 29 percent increase in the number of millionaire tax filers. New York however saw only a 14.6 percent increase in the same period, the lowest rate of growth in the country. The report further points out that New York had also “trailed the national rate of increase in the number of taxpayers earning AGI of $200,000 or more.” Authors E.J. McMahon and Daniel Russo argue that these are troubling indicators and point to weaknesses in the state’s economic growth and wealth creation. In fact, there is good reason to believe taxes may play a role in slowing the rate at which states gain new millionaires. One deterrent for the state’s wealth creation is its “Millionaires Tax.” As we have written before, some states have been more willing to raise income taxes by designing the increase to affect only a small subset of high-income earners. The income level at which the new top rate applies is often a sharp jump from where the top rate previously applied. In the case of New York, rates jump from 6.85% to 8.82% on incomes over $1 million. Furthermore, New York is one of three states to have an “income recapture” provision, whereby taxpayers with income over a certain threshold must pay a higher tax rate on all income below that threshold as well. Provisions like these can encourage tax avoidance and extra tax planning at least, distortionary income and benefits restructuring in many cases, and at the extreme even increased out-migration and diminished work incentives. New York is ranked 50th in our 2014 State Business Tax Climate Index, and has the highest state-local tax burden in the country at 12.6%. Such uncompetitive tax policy can negatively impact economic growth generally, as we have demonstrated before. But the case of millionaires is even more straightforward. 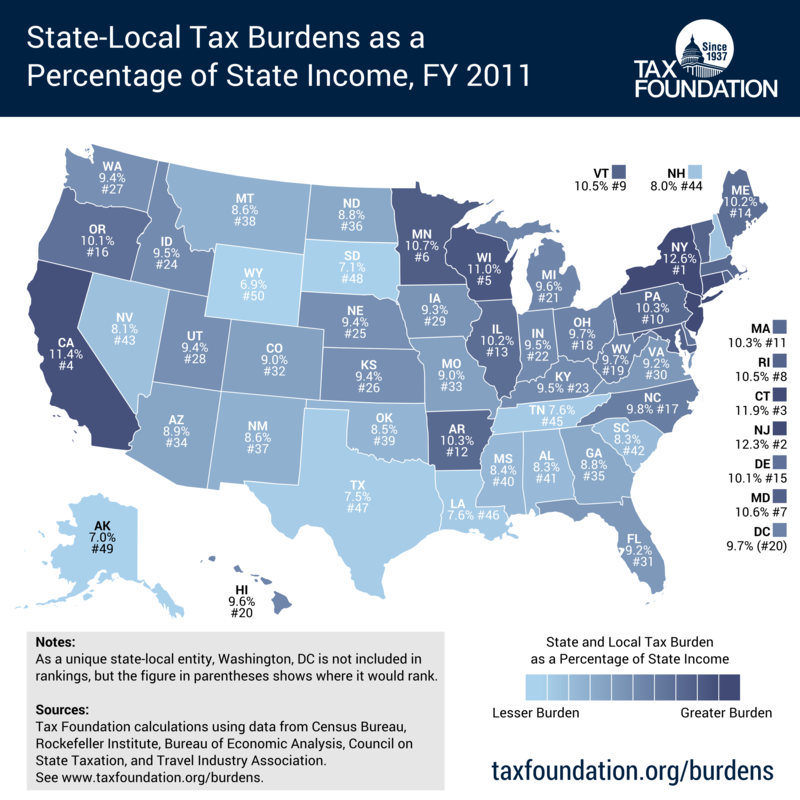 Even without any controls, state-local tax burdens can account for 44 percent of the variation in millionaire growth rates among the states. A regression of tax burdens, economic growth, and state price levels can explain over 70 percent of the variation in state growth rates for millionaires, and higher tax burdens remain a significant indicator of lower growth in millionaires. In many cases, the relationship between taxes and economic variables of interest is complicated. But in some, it’s simpler. With New York having some of the most burdensome taxes in the country on individuals who may be most sensitive to taxes, it makes sense that growth in millionaires would be slower. Throughout the nation, more burdensome taxes are associated with slower formation of millionaires. At least some portion of New York’s slow millionaire growth may be due to migration. This can be seen from our state migration map, which shows that from 2000-2010, New York had a net loss of $45.6 billion in personal income from people leaving the state. While the state remains a leader in terms of millionaires per capita for now, the state’s continuing high taxes may help other states take the lead. Just since 2010, New York’s share of millionaires nationwide fell from 12.7 percent to 11.2, while Texas’ rose from 8.5 percent to 9.3. New York’s recent tax reform was a step towards less economically damaging taxes in the Empire State, but there remains a long way to go before the state’s whole tax code will be truly competitive. Read more on New York. Read more on Millionaires’ Taxes. Follow Josh and Lyman on Twitter.